jrok’s Williams FPGA… in development! If you are like me, you acquire arcade games. Let’s just stop with that. You are probably not like me, going forward from here, but we’ll try to keep things interesting and geeky from here. The circuit boards are the real treasure in an arcade game, because almost everything else can be — or is! — getting reproductions. Scratch up the side art on a game? Stencils or giant “stickers” exist. Mess up the monitor? You can put a brand-new one in, most likely. But yeah, if the circuit board develops problems the average collector is at the mercy of others. 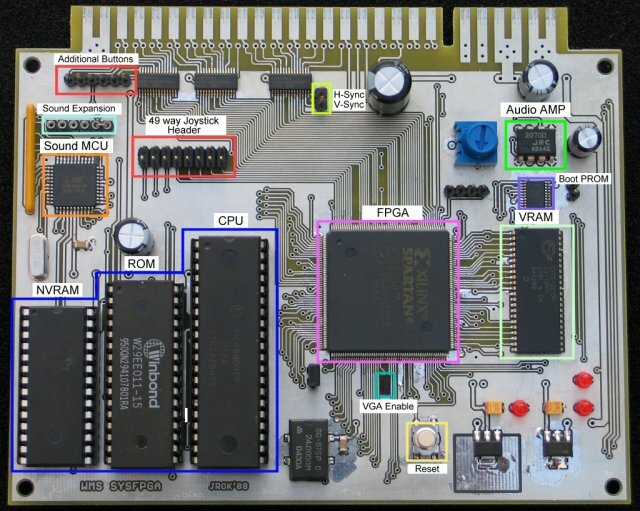 So that’s why FPGA boards like what jrok is developing are so cool – he’s putting Defender, Stargate, Joust, Robotron, Bubbles, Splat, Sinistar and Blaster onto a single board. It uses real hardware, so nothing is emulated (more on that in a sec). This is going to give people the chance to avoid circuit board issues and still have a great multi-game kit. It’s also going to have a JAMMA interface, which will be really convienent for, er, people like me who have a JAMMA cab. I don’t even know if Williams (the manufacturer of all those games) are particularly troublesome to live with – for all I know, they could be rock-solid. But it would definitely cost me a lot more in space and, er, cost a lot in money to get access to those games. And I am completely out of space. jrok also has the things saving high scores, so at $150 for the board, this will be perfect. jrok is sending the board out to testers soon, and I’ll report back when I purchase one. 1) The font. I was given this by a gentleman that contacted me through the JC BBS. I have received some e-mail from people asking for the font, and while I love that sort of contact, it’s not fair to not have it available for everyone. But please – you wanna talk some Polybius, just send me an e-mail at beaver@zombieworld.com. 2) I was recently made aware of the site www.polybiuslives.com. They have a screenshot of what Polybius might have looked like if it was on a color X/Y monitor. Good stuff – not sure if there is more stuff at the site that is not obvious to get to, but when I know more I’ll update. I also noticed that there was a mention of polybiuslives.com on Shawn Struck’s blog, so perhaps this is making the rounds. The machine we’re talking about today is a circuit board that lets you make your JAMMA-compatible arcade cabinet capable of playing 48 games instantly and easily. It really is an amazing piece of work, and I am going to hotlink a picture of it from Lizard Lick Amusements. It’s a cute little guy that I’ve had the pleasure of installing and running the last couple of nights. If you are unfamiliar with the concept of JAMMA, it basically allowed arcade operators to swap circuit boards and have themselves a brand new game in a cabinet they already owned, to generate more CASH. Ops love CASH. (Usually, when swapping a board in this manner, they’d swap the marquee and control panel at the same time, but hey, not always.) JAMMA eventually had some extensions to account for the extra buttons in a Street Fighter or Mortal Kombat machine, but for the purposes of the 48-in-1 you just need three buttons wired up, a joystick, and then some for service and starting the game and so forth. If you’d like to buy one of your own, check out the KLOV forum here, or just leave me a comment in this post. This post over at Engadget shows you how to get JAMMA going if you don’t happen to have a full-size arcade cabinet, y’know, just hangin’ around not doing anything. �For the rest of the FAQ, I’ll see you after the jump!